Found in the northern region of Lee’s Summit, Missouri, the family friendly neighborhood of Deerbrook offers homebuyers with a great selection of single family homes at affordable prices. Close to many popular thoroughfares like MO-291 and Chipman Road, buying a home in Deerbrook ensures that every modern convenience is just minutes away. The surrounding Lee’s Summit area is home to approximately 91,400 residents, and a plethora of shops, restaurants and amenities. Homebuyers will love the attractive homes for sale in the Deerbrook neighborhood. This subdivision is mainly comprised of single family homes, and is a family-centered area where most residents own their home. This brings a stability and strength to both the real estate market and the neighborhood, creating a perfect location for families to buy a home, settle down, and raise a family. With the prices of homes for sale in Deerbrook averaging at $162,500, this subdivision is also an affordable place to buy real estate. Residents in Deerbrook not only benefit from a strong economy and a great location, but families that buy a home here can also provide their children with top-rated schools, and safe neighborhood streets. 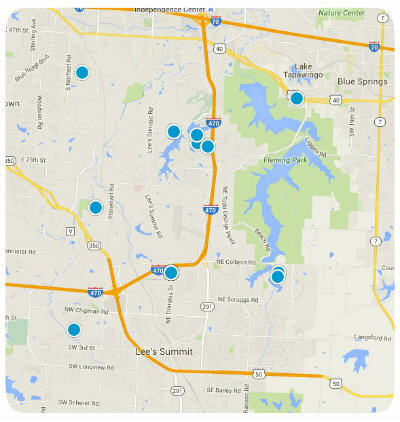 Lee’s Summit School District has long been ranked highly, and with most adult residents possessing a college education, the schools in this area are strongly supported by the community. Deerbrook is also considered to be easily walkable and dog friendly, which is great news for families with pets, and for those that want to live an active and healthy lifestyle. If you would like to find out more about buying a home in the Deerbrook subdivision of Lee’s Summit, Missouri, please don’t hesitate to contact us today. Listing courtesy of Sandy Krueger of ReeceNichols Town Center. Listing courtesy of Caleb Foster of RE/MAX Elite, REALTORS.